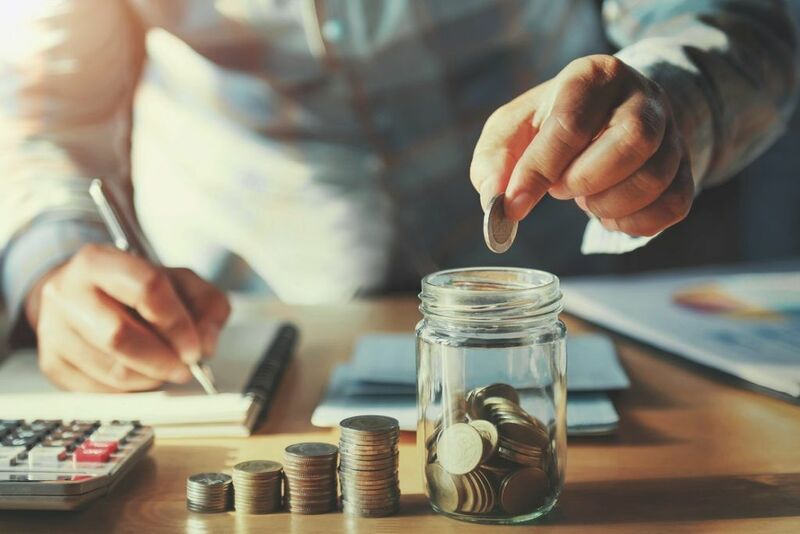 "Increased savings in the short term can reduce savings or rather the ability to save in the long term"
The Paradox of Thrift states that increased savings in the short term can reduce savings or rather the ability to save in the long term. The Paradox of Thrift arises out of the Keynesian notion of an aggregate demand-driven economy. An increase in the rate of saving reduces consumptionConsumptionConsumption is defined as the use of goods and services by a household. It is a component in the calculation of the Gross Domestic Product (GDP) in the economy which, in turn, reduces total output (via Keynesian consumption). According to British economist John Maynard Keynes, when people save during a recession, the level of consumer spending decreases, which eventually slows down economic growth. In 1936, Keynes wrote a controversial book called “The General Theory of the Economy” in which he declared that spending and investment in the economy were the keys to increasing economic growth. He believed that the level of output and employment did not rely on the capacity of production, but rather on the decisions taken by individuals in society to spend and invest their money. Additionally, it was the role of the central bank to reduce interest ratesInterest RateAn interest rate refers to the amount charged by a lender to a borrower for any form of debt given, generally expressed as a percentage of the principal. The asset borrowed can be in the form of cash, large assets such as vehicle or building, or just consumer goods. and encourage greater investment. Keynes did not view saving as its own entity but rather as an excess of what is spent. Investment is the acquisition of capital goods, while consumption of goods and services helped increase national aggregate income, saving was just an element of income that leaked out of the circular flow of income. 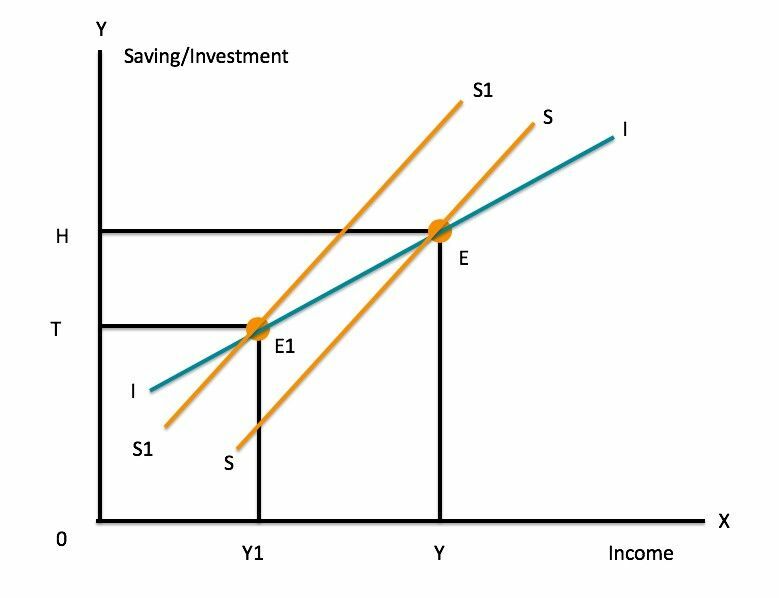 The economist defined saving with the formula S = Y(1–t) – C. That is, savings is a part of the income that is taken out of total consumption. Line I shows the relationship between investment spending and Gross Domestic Product (GDP)Gross Domestic Product (GDP)Gross domestic product (GDP) is a standard measure of a country’s economic health and an indicator of its standard of living. Also, GDP can help compare the. Line S shows the correlation between savings and GDP. When people wish to increase savings from S to S1, it leads to a fall in real investment (OH to OT) and income (OY to OY1). The Paradox of Thrift, while practical in its reasoning, attracted numerous criticisms from neo-classical economists. The neo-classical economists argue that a consumer saving is viewed by the market as a signal of supply-side inefficiency. A consumer saving sends the signal that the consumer DOES NOT WANT to consume any of the goods in the market at the prevailing market price. Therefore, producers should either lower the price or change the goods and services being produced. Thus, the action of not consuming does not reduce future output but merely forces the market to optimize. Under standard neo-classical economic growth theory, saving is essential to economic growth and technological innovation. Most modern theories of innovation argue that a threshold level of capital needs to be reached before innovation can occur. Technological innovation can significantly raise the total amount of output in an economy.